Blog Hoppin': Love Those Polar Bears! Just a short post to share our big polar bear hanging in our classroom! It is SOOOOO cool for the kids to see how tall a polar bear would be if he stood up on his hind legs - almost 10 feet tall! My co-partner, Lisa, gave me this idea! I enlarged the polar bear picture to 10 feet on our old overhead. I had to do it in two parts! The polar bear sketch is very skinny because I wanted him to fit in the laminating machine. 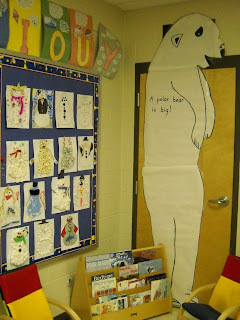 So, the realism is a little off, but the IDEA of the height of a polar bear is brought into the classroom! I take each child's picture standing next to the polar bear - Wow! A polar bear is big!